Figure 1. A western blot of HEK cells transfected with GPR37 or GRP37L1 probed with GPR37-3 at 1:10,000. Size: 50 ul rabbit sera in glycerol. Known Specificity: Mouse. Human and rat based on sequence homology. These working conditions are provided as a suggestion only. Each user should determine optimal conditions for his or her own experiment. 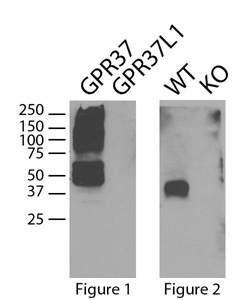 Source: This rabbit polyclonal antibody was raised against a C-terminal peptide coupled to KLH.